A lot can happen in a matter of seconds: Brakes fail, guardrails give way, lives change. 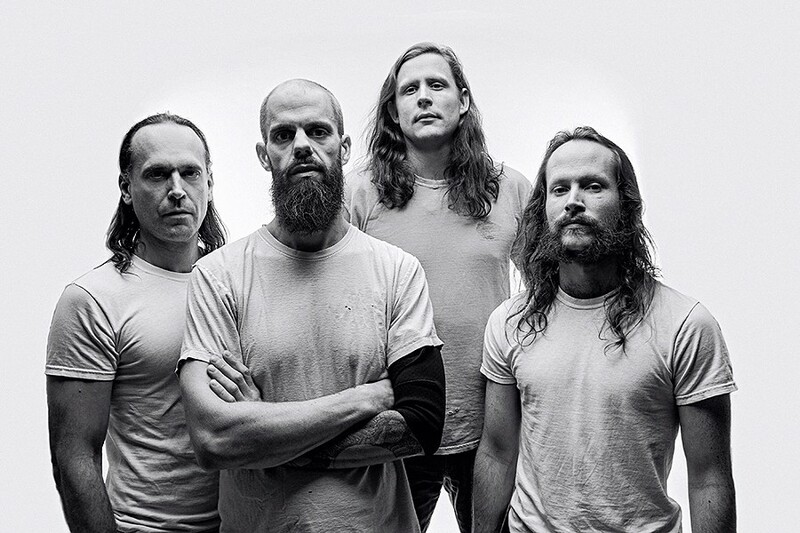 "Everything also slows down," says Baroness frontman John Baizley, recalling how his band's tour bus plummeted down a 30-foot embankment on its way to a gig in the southwest of England. But Baizley and his cohorts beat the odds, and are now touring on behalf of their most successful album to date. Produced by David Fridmann of Flaming Lips fame, Purple debuted at No. 1 on the indie charts, and placed No. 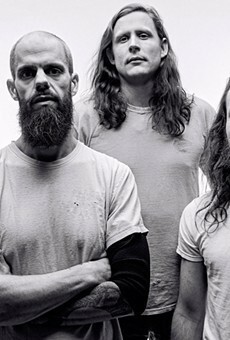 7 on Rolling Stone's Best Metal Albums of 2015 list. Despite the happy ending, the more than two years between accident and album release were anything but easy. Baizley, whose left arm was shattered in the crash, only regained the ability to play guitar after surgeons implanted the two 9-inch titanium plates that now hold his elbow in place. Meanwhile, the band's rhythm section resigned, leaving Baizley and longtime guitarist Peter Adams to recruit drummer Sebastian Thomas and bassist Nick Jost, who is also responsible for the keyboards that play a big role on the latest album. Musically, the Savannah, Georgia, band has managed to take several steps forward. Arrangements on Purple, the group's fourth studio album, draw more upon the post-punk, progressive rock and down-tuned sludge elements that were largely drowned out in the driving melodic metal that dominated their first three releases. Fridmann's production techniques and psychedelic inclinations bring a sonic adventurousness to the table, resulting in the band's first true "headphones album." 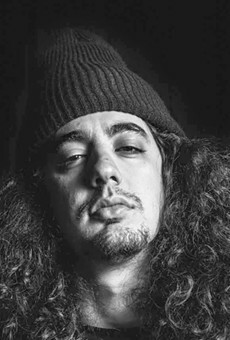 In our interview, Baizley candidly discussed the aftermath of his near-death experience, and the art that came out of adversity. I understand the band spent nearly a year in the basement, writing and making demos for this album? John Baizley: I think it was a combination of things. We'd toured with our new rhythm section for something like eight months, so we knew we had a musical rapport. But when it comes to writing, that's a different thing. And we needed all four members contributing, because that is how Baroness writes. So it took a couple months to figure out how to lock into that. It also wasn't a particularly easy year, personally speaking. So there were some physical and mental obstacles that probably delayed things a bit. You toured extensively prior to making this record, and you've got a lot of dates coming up. Was it hard getting back on that bus the first time? That was a breeze, honestly. I had no problem with it whatsoever. I thought I would; it made sense. But it just didn't rattle me at all. I mean, there are moments at night – if it's raining, you know, if it's cold, if there's ice on the road – my first thought is "If it's gonna happen, let it be quick." Because, you know, when we were in the accident, nothing was quick. It felt like an eternity. But now, I've already gone through a period where I've accepted my own mortality. So I've crossed that threshold. Usually, when artists go through a situation like that, they start writing very personal songs about it. But you've continued to use a lot of fantasy tropes in your lyrics. Well, my goal as a lyricist has always been to write about the experience that I have. But I make a very conscious attempt to not focus on the specifics and the idiosyncrasies that make it the story of one person. I've always thought of lyrics as a universal language of pain and suffering, and anguish, and torment, and reflection. Yeah, but I try to be realistic, and joy is the by-product of pain. You have to understand the opposite of joy in order to understand joy. And vice-versa. Think of that joyous moment at the end of Beethoven's 9th Symphony, where you've spent 45 minutes listening to despair, and then all of a sudden, in the space of 10 seconds, the entire mood shifts. And it's not the joy of waking up in the morning on a sunny day and knowing everything's gonna be alright. It's the joy of accepting things and gaining a deeper understanding of who and what you are, and what your station in life is, and being comfortable with that.